I am not a morning person. As some of you may remember, I made a resolution this year to wake up earlier, so I could be more productive during the day and spend less time surfing the web at night. So far, I’ve made about as much progress as I did that time when I was fourteen years old and decided to read Crime and Punishment just for fun. Needless to say, fourteen-year-old-me gave up on that goal. But the me of today is NOT letting go of trying to become a morning person. Not yet, at least. In an effort to make dragging myself out from beneath the covers a little less painful, I made egg breakfast muffins. Aka, single-serving crustless quiches. 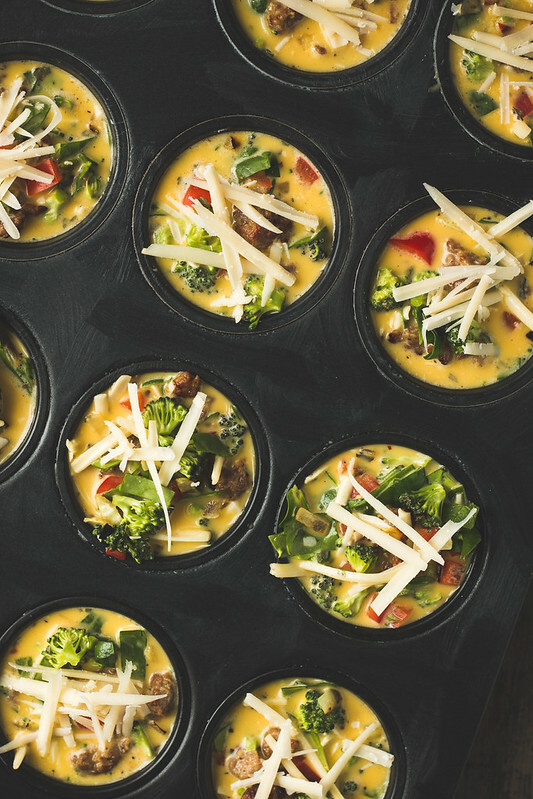 Aka, grab-and-go frittata bites. Basically, an omelet you can reheat and enjoy whilst still in a half-awake zombie state. Braaaains! Err, I mean, breeeeakfast, breeeeakfast! I don’t know about you, but when I’m trying to get going in the morning, nothing makes me feel better than a protein packed breakfast. Some people are happy to eat waffles or pancakes or doughnuts for breakfast each morning (*cough* T-Hubs *cough*), but for me, I prefer to kick things off in a healthier way. If I start on track, I’m more likely to stay on track… and vice versa. The thing is, I’m groggy mcsleepy-pants when I get up in the morning, and cooking myself breakfast (and dirtying a bunch of dishes) isn’t usually the first thing I want to do. These little muffins solve that problem. One batch makes about sixteen muffins. I find that two are the perfect serving size for me (or three if I’m really ravenous), which means I can make a batch over the weekend and have breakfast ready all week long. A few seconds in the microwave, or a few minutes in the toaster oven, and these babies are ready to go. Even if you aren’t groggy mcsleepy-pants, these mini quishes are your friend. They can be made with just about any ingredients you choose (perfect for using up whatever veggies you have hanging around in the fridge) and are really simple to throw together. You could even make them in a mini muffin tin, and then they’d be super cute and bite-sized. As I learned from these mini bananas, tiny is always better. If using meat (bacon, sausage, etc. ), cook it fully first. Set it aside to cool, then cut into small pieces. Get all your veggies diced up and ready to go. Optionally, you can saute your onion with a bit of olive oil to soften it up and take away some of its bite. Set aside and allow to cool. Add all the veggies to the bowl with the egg mixture, and stir to combine. Stir in half of the cheese, and all of the meat, if using. Using an ice-cream scoop or ¼ cup measure, scoop the mixture into the prepared muffin pan. Fill to about ¼ inch from the top, then sprinkle a small amount of reserved cheese over each. Place in the oven, and bake for 20-25 minutes, or until the egg is fully set and the cheese has just started to turn golden on top. Remove from the oven and let cool for 5-10 minutes before running a butterknife around each muffin, and gently removing from the pan. 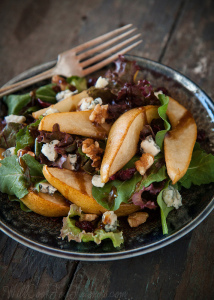 Enjoy while warm, or let cool completely before storing in an airtight container in the fridge. Leftovers can be reheated for several seconds in the microwave (time will vary depending on your microwave), or a few minutes in a preheated oven or toaster oven. 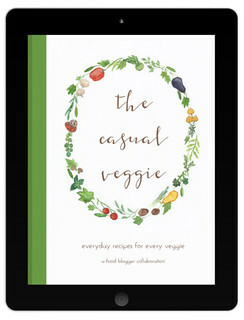 *Feel free to sub in whatever veggies you like, or have on hand. I used about 3-4 cups of chopped veggies in total, and wouldn't suggest using much more, otherwise you won't have enough egg mixture to go 'round. This post contains an affiliate link. This means that if you follow a link to amazon.com and make a purchase, a small portion of your purchase goes to me, at no extra cost to you. I am not sponsored by any of the products I link to, they are just the items I personally use and would recommend. Your support helps make this blog possible – thank you! I want to make friends with these egg muffins. Girl, you are not the only grump-grump in the morning. This gal (pointing at myself) is not very nice in the am. Pinning these! 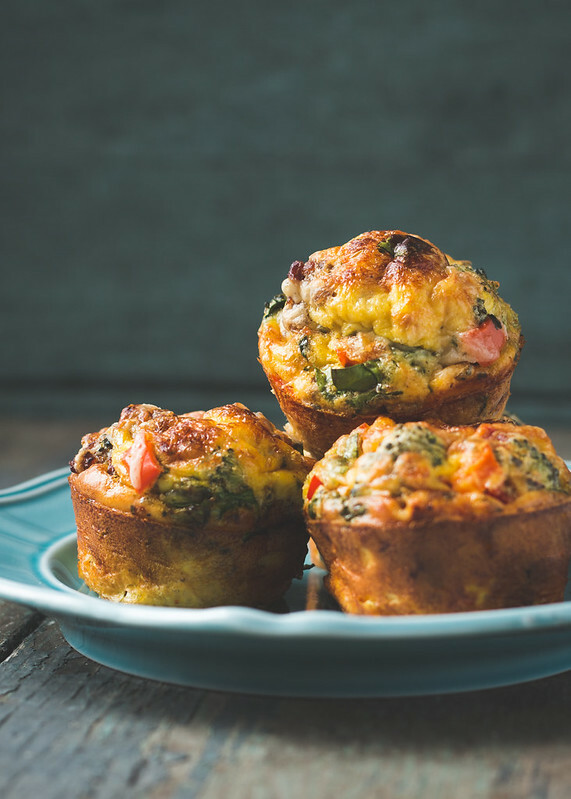 I <3 these yummy breakfast muffins! They freeze beautfully, just cool them overnight so they dont have moisture and get icey :/ Trying to stay away from plastic bags, the batch I made yesterday I put in mason jars to freeze, then I microwave them for 30-45 seconds. I used pork caramelized onion and bell pepper sausage crumbled, frozen veggie medley from Costco (carrots grean beans peas and corn), sauteed spinach, parmesan and feta cheeses, and standard S&P& herbs de provence. (ALSO subbed cream for LF cottage cheese to reduce fat). YUMMY!!! Only PROBLEM, I use generous coconut oil, and the bottoms always stick :( SUGGESTIONS? paper cups they shrank up, and stuck. Thanks for the comment, Sarah, I’m glad you liked them! The pork and caramelized onions sound amazing. I’ve never had a problem with them sticking (I use a non-stick pan, sprayed with coconut oil cooking spray), but another commentor mentioned that they came out much easier after being left to cool for a few minutes. If they’re hot from the oven, they’re much more likely to cling to the pan. Another option would be to bake them in those silicone baking cups, which they should pop right out of. Hope that helps! Willow, this recipe has become one of my all time favorites-loved by me,my husband, live in mother in law (all of us retired), and also for my daughter and son-in law as grab and go breakfasts before work. I have no problems with sticking when I use non stick pans pre sprayed with oil. One addition we all like: I spread out a roll of refrigerator crescent rolls (like Pillsbury or store brand )and cut out circles to put into the muffin bottom. Then I add the meat (our favorite is hot Italian sausage), veggies and cheese (pepper jack), and lastly the eggs and cream mixture. The crescent roll dough adds a little bottom crust to the quiche and adds just a little sweetness that I like a lot. Success has its drawbacks, though. I cannot keep up the supply of these to meet the demand, even with making extras and freezing! Thanks for a great recipe. Thank you so much for the feedback, Chris! I’m so glad you and your family love this recipe. Hearing that makes my day! I love these, and make different variations all the time. But I never had success getting them out of the pan without sticking until I switched to silicone muffin liners. Tried different oils, butter, flour, paper liners, etc. The silicone liners make everything so much simpler, since the muffins pop right out and cleanup is SO much easier. Try them! Thanks for the tip, Rachel! I haven’t tried silicone cupcake liners before, but will have to pick some up. Glad you like the quiches! AMEN! I have fallen in love with those silicone muffin pans. Nothing fails to come our nice, easy, and un-torn. I cut up baking paper into quick ‘circles’ about the same size as the base of the muffin cups, then if you leave them for a few minutes, you can run a knife around the sides and the bottom wont stick. That’s a fantastic idea, Carol! Thanks for sharing! Use silicone muffin “tins”. They pop right out. I like adding in a bit of Bisquick- that seems to hold them together a bit more and be less “eggy.” I even made some with ham, Swiss cheese, and mustard to approximate a Reuben Sandwich, and my husband liked them. Diced ham is always my main meat, with crumbled bacon or sausage added for extra flavor. Mushrooms, while tasty, seem to be too full of water. Pecorino Romano, while expensive, is an excellent topping. Great advice, Lucinda, thanks! I’ll have to try your Reuben variation sometimes, sounds delish! How much Bisquick do you use? I also think I’d like a slightly breadier muffin (and might have less trouble with the fallen souffle effect). I don’t use any Bisquick in these. If you want a breadier, less eggy muffin, adding either bisquick or a bit of all purpose flour to the recipe is a great idea — just make sure that it gets integrated into the egg mixture without any lumps. If you try it, I’d love to know what you think of the results! Mushrooms and fresh garden tomatoes and onion work great with most cheese choices! Keeping them a little moist will prevent sticking. I always wondered if those silicone pans worked. Thanks for the tip! I use a non stick pan and no spray or oil and they come right out. I add the veggies cheese and cooked meat to the tins and fill them first. Then top w egg mixture almost to top. A little more cheese on top. just rub down the muffin pan with cold butter fresh out of the fridge. Use a butter knife to guide them out, and they should come out without any problems! Used butter in in stick-free pan. Came out without any problem. Glad to hear it, Nancy! Can these be frozen and how long will they stay fresh in fridg? Yes, they can be frozen! I keep mine in the fridge for up to a week, sealed in an airtight container. although i’m really much more of a morning person than most people (but not to the point where it gets all perky: i would never be overly cheerful about being up at 5, but i AM up), my problem is that i start doing things very early and sometimes feel flustered about stopping to make a proper breakfast. Since i can’t function forever without some protein, toast or a bagel is out. these are totally the solution to my problem, plus, they are adorable. who knew eggs could be so cute and colorful? I’m def a morning person, but I also need a healthy, hearty breakfast to get me going…these look so perfect. I’ve been looking for portable things to take on the train now that I have to commute. I will def give these a try!! Thanks Rosieroe, so glad you like them! I’m afraid I don’t know of any way to keep them puffed up after they’ve cooled. Once the steam has had a chance to escape, I think they’re destined to be a little flatter than they were fresh! These look great! My only question is, can they be frozen? I just worried about them going bad before I could eat them all. (Single with no kids) I could always cut the recipe in half, but just wanted to check. Hey Kim! You know, I’m not sure how they would hold up frozen. It’s worth a shot, though. I’d start by making a half batch and then freezing just one or two to see how it goes. Let me know how they are if you try it! Hey Kim, these freeze really well! I let them cool completely and slip them in a zip lock bag and freeze. Over the summer I was going to be gone for a few weeks so I made a double batch for hubby and put in the freezer for him….he was a happy man. I call them must go muffins….everything in the fridge must go….ok so maybe not everything but it is hard to mess them up!! That’s great to know, Ginger! Thanks for sharing. I love that you call them must go muffins — I do the same thing with these when I have a bunch of produce that needs to be used up! Will have to try making a big batch and freezing them next time. I’m not exactly a chef, so may i ask what cream you are using? Good question, I should have been more specific in the recipe. I use heavy cream (also called whipping cream, or “double cream” if you’re in England). Hope that helps! Made these with a slight twist for 12 quiches and used half with hot sausage/Cheddar and half with ham/Swiss. thank you! These are fantastic!! One note….the first time I made them, I sprayed the muffin tin with Pam, and they stuck terribly. Today, I made them again, and buttered the heck out of the muffin tick. Again, waited 10 minutes, and again, they were so stuck they were shredding as I tried to remove them! I got very angry after fighting with half of them, and stormed away. Lo and behold, when I came back 20 minutes later, I picked up the muffin tin, and the remaining six almost jumped out on their own! In case anyone else finds that they are sticking, I recommend waiting a bit longer to remove them. Will keep making, thanks for the recipe! I’m glad you like them! Sorry to hear they stuck so bad… I haven’t encountered that at all. Were you using a nonstick muffin tin? Another option would be to use cupcake liners. I know that sounds odd for something savory, but hey, they wouldn’t stick! Like you I am a groggy McSP in the am but these look so good gotta try them. Thanks! These look fantastic! When I make them, however, they are not as dense or heavy as the ones I expected. They “puff” up. Any suggestions? Hi Jennifer! That’s just the way they are in this recipe — mine puff up too, kind of like little souffles. That’s just how the eggs work (moisture in the eggs evaporate, causing them to rise, and as the egg proteins set, they hold that shape). I’m not sure what you could do to make them denser… perhaps adding more ingredients (more veggies or other add-ins), or cooking them at a lower temperature, so the eggs set before they puff up too much? I’m just guessing, here, since I haven’t played around with it myself. Hope that helps! I’m newly diabetic and NEED to eat a good breakfast but not a morning person either so these are perfect!!!!! i just made these using well oiled non stick pan but they really stuck. Read above comment and am waiting for more cooling to try again. My biggest issue was that they were tall and puffed but as soon as I took them out of the oven the collapsed quite flat. I followed recipe and quantities exactly. What can I do next time to keep them puffed? P.S oven was just 350 then I realized and put it up to 375 for the last half of cooking time. Hi Sandy — hmm, I’m not sure why they would fall like that. I’ve made these multiple times, and while they do deflate a little as they cool, they’ve never gone “flat” for me. Another commenter recently mentioned hers being too light and fluffy, so perhaps it has something to do with different eggs, or different ovens? I’m sorry I can’t be of more help on this one! I hope they’re delicious anyway! Hi yes they were tasty after all, just hoped I could make them look like the photos. It was like a souffle that collapsed. odd I know. Same thing happened to me. They did not look anything like the picture and I was very disappointed. 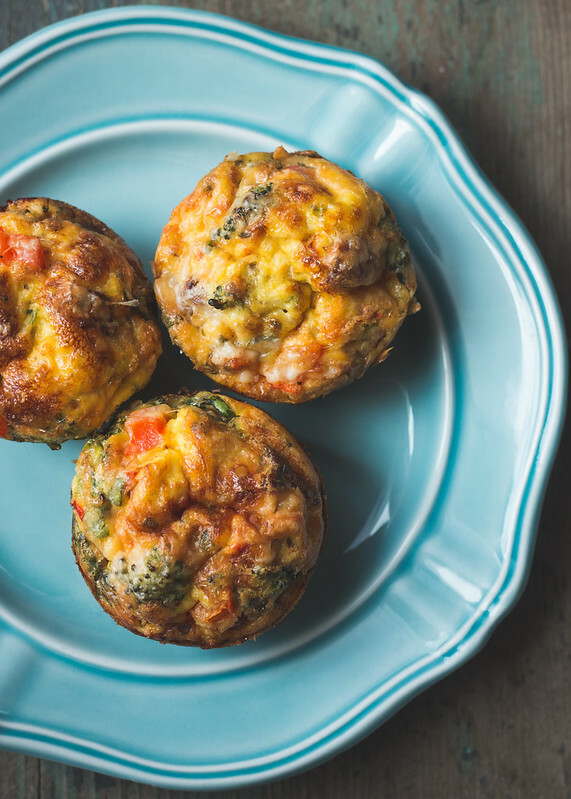 This recipe is more like a mini frittata or souffle not a “muffin”. They puffed up and quickly collapsed just like a souffle would. I also had a lot of trouble getting them out of the pan despite using a high quality cooking spray and waiting 20 minutes before attempting removal. Cleanup was also messy. Leary of making them again. Agree with Sandy M.on appearance as they do not look like the photos at all. Wouldn’t call them muffins either as they are really mini fritatas. Besides muffins usually have flour, baking powder,etc so the name is misleading. Very difficult to remove from nonstick pan despite using a good amount of good quality cooking spray and waiting 20 minutes to try removing them. Clean-up also difficult. These sound divine, but is there a way to make them without the cream? My daughter is not allowed any dairy. I can substitute the milk for soy, no drama there, but have not found a suitable (or readily available here) substitute for cream. Any ideas? Hmm, that’s a good question, Debbie. I can’t say for certain, but I have a hunch this recipe might work without the cream (just replace it with more of your dairy-free milk). It might help to add a little fat, too (either some coconut oil, or a bit of earth balance or whatever butter substitute you prefer), just to add that richness. I wish I knew of a good cream substitute, but I haven’t found one, either. Best of luck! I know I am replying to an older post and your comment is from a year and a half ago but still wanted to share. I am lactose intolerant. When a soup recipe calls for heavy / whipping cream, I sub with soft tofu. I puree it first with a hand immersion blender. It’s still a soy product, and ends up thicker than soy milk. I haven’t tried these egg muffins yet, but was thinking that’s the cream sub I would make. Thanks for sharing, Nikki! That’s a great idea. You’ll have to let us know how it goes with the tofu if you try it! Great recipe, I was wondering how long these will stay good in the fridge. I heard up to 6 days but I read meat does not stay good in the fridge that long so how will eggs. Thanks Jessie, glad you like them! I keep mine in the fridge for up to 6-7 days, in an airtight container, and they seem to be just fine. I’d be hesitant to keep them much longer than that, though. Another commentor did mention that they freeze really well, though, so you could always put some of them in the freezer and then thaw them when needed. Hope that helps! I just made your recipe this morning – they turned out great! I wanted to share with you my secret ingredient in cooking – ghee (clarified butter). I rubbed ghee in the muffin cups with a paper towel then poured the quiche mixture in. Immediately upon taking them out of the oven they came free, actually they were not even touching the sides of the pan. Perfectly ready to serve hot. I use Ghee with all my stir frying as well – it never burns as it has a high smoke point. These are not just for breakfast! I make a double batch and use half for breakfast and the other half I freeze and serve 2 with a big salad for lunch. Thanks, Maggie, I’m glad you like them! That lunch sounds perfect! Thanks for the recipe! I’m cooking for a crowd tomorrow and was wondering if it would work to make the egg mixture the night before and just bake it the morning of? Hi Jamie! You should be able to make the egg mixture ahead of time, but I would suggest holding the salt until just before you’re ready to cook them. If you add the salt to the eggs too soon, they can get really watery and won’t bake right. Hope that helps! I’m not a baker or much of a cook at all and just whipped these up! So delicious and easy, thank you! Thanks, Steph, I’m so glad you liked them! My husband and I are low carbers and this looked like a great way to get his breakfast in him before he leaves for work, which is quite early. Unlike you, I am a morning person, but only to an extent. Cooking eggs and bacon at 7am was getting old. These tasted great but I experienced the same problem as many others. They stuck AND they collapsed. I don’t have a non stick muffin pan (not a fan of non-stick cookware) but it is a good heavy muffin pan. When they came out of the oven they were picture perfect and then everything spiraled downward. I gave them 10 minutes to cool and when i came back, they had all collapsed and I could not get them out of the pan so I have 16 quiche discs! I made mushroom, onion and fontina quiches. I sprayed the tins with coconut oil The good news is that they were delicious and I can use them, but they don’t look like muffins, more like flying saucers…and it was a nightmare cleaning the pan. I am going to try again and let them cool all the way down before removing and see if that does the trick.Then I can always try the cupcake liners. Hi Judy, thanks for your comment! I’m glad to hear they tasted good (mushroom, onion, and fontina sound like an amazing combo!) but am sorry they stuck so badly. I can totally understand disliking nonstick cookware, but it makes does make a big difference for these muffins. Definitely try letting them cool completely next time and see if that makes a difference (you could also try, if you’re using coconut oil to grease the pan, chilling the pan for a little bit after greasing so the coconut oil solidifies before pouring in the egg mixture). As for the collapsing part, mine do that a bit, too. I just fill the tins most of the way full so they still look okay after they cool, if that makes sense. 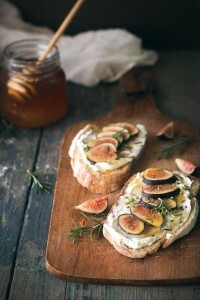 I would love to make these for a picnic, but will not have a means to reheat them. Will they taste okay if cold? I personally don’t find them very appetizing cold, but others might. If you have time, I’d suggest making a batch ahead of time and seeing what you think — if they taste okay to you, then go for it! Roll flat some slices of bread and butter one side, find a cookie cutter or glass or jar top same size as bottom of tin. Then place butter side down in bottom to prevent sticking ! Good idea, Sylvia! Thanks for sharing! From one non-morning person to the other, I thank you! These look fabulous! You’re welcome, I hope you like them! Just made these! Can’t wait till the morning! I reduced by third to make 6 muffins. Thank you for the recipe! I made these last night and re-heated this morning. Despite the fact that I took a few liberties with the ingredients to avoid a trip to the store, I made a half batch and they are so good! I saw one or two posters asking about “density.” I used a liquid egg substitute (3 tbls = 1 egg) and replaced the 1/4 c milk with cream and they did not puff up, so that might be an option. They held together pretty well and slid right out of the muffin pan. I also used steamed spinach and broccoli left over from dinner and it worked fine, I just used less to account for density. I’m going to try with fresh peppers, zucchini and spinach next time. Also use less salt if you are going with the meat option and using bacon. Great info, Ryn, thanks for sharing! So glad you liked these! I just Made these and they came out just like the picture. None of them stuck to the pan. I used pamper chef muffin pan and oiled it with olive oil spray. They taste delicious. So I made another batch and will be freezing them. Thanks so much for posting this recipe. Thanks for the feedback, I’m so glad you liked them! have you ever made this in mini muffin pans? I made these last night using oregano & thyme in place of the basil (which I’m out of), spinach, mushrooms & an Italian blend cheese. I made 1/4 of the recipe with a full cup of veggies to try it…which made 6 quiches. They jumped right out of the buttered pan. I had a couple for dinner & just re-heated one. They’re delicious!! I plan to make more today, maybe some with Swiss & some with habanero cheddar. Thanks for a great recipe with a lot of versatility! Thanks, Denise, I’m so glad you liked them! Spinach and mushroom are one of my favorite combos for these — and the habenero cheddar sound amazing! THANK YOU SO MUCH FOR THIS RECIPE!!! It’s a hit with the family every time I make it. Yum!!! So glad you like it, Tara! Haha, I happen to be a big fan of broccoli, but I totally get that it is not most people’s cup of tea in the morning. All of those would be great in its place! Just took my batch out the oven. I used caramelized onions, ham, cheese and zucchini. They turned out amazing. Way better than I expected given my baking skills. Thanks a bunch for the recipe inspiration! Thanks, Georgia, so glad you liked them! They sounds amazing with the caramelized onions and ham! A MAZE INGGGG!!!! I made them for a New Year’so Day brunch – they rocked!!! Thank you for sharing your recipe! So glad to hear it was a hit, Chell! Thanks for taking the time to tell me! These are delicious! I made mine vegetarian, with all the suggested vegetables and I can totally see this being the perfect quick breakfast. I used paper muffin liners and had no stick-related issues. I’m so glad you liked them, Melissa! Great idea to use paper liners, I’ll have to do that next time! Thank you and here’s to trying to be a morning person… again! Hi Jeanne, thanks for asking! If your pan does indeed make larger muffins than a standard cupcake pan, than you will need to increase the baking time. Since I haven’t tried it personally, I can’t say by how much. If it were me, I would lower the baking temp slightly, and let them bake longer, this way the inside of the muffins will set without the outside getting overcooked. You can check them by inserting a knife into the center of one, and if any raw egg sticks to the knife, or if it looks particularly wet or loose in the middle, they aren’t done yet. I hope that helps! OMG! How come I never thought of this? I make quiche all the time. Now I can send a portable breakfast off with my “don’t have time for breakfast” husband in the morning. They are in the oven now. Thanks Willow! Thanks Maralee! I hope you like this mini version! I can’t figure out how you got these to fluff up so much. I just made some today, but they never fluff up like muffins, like in your photos. Mine just fall immediately and turn into little discs of eggy goodness. Still taste good, though, so no complaints! :) Thanks for your recipe. Huh, I wonder why that is? Mine have always puffed. Maybe it has something to do with the eggs. You could try whisking the eggs really well before adding the rest of the ingredients — try to incorporate lots of air at the beginning, and see if that helps. Glad you enjoyed them anyway, though! 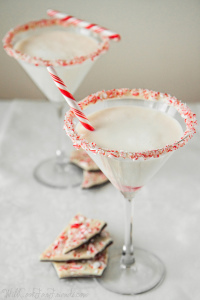 These sound wonderful….too bad that I’m allergic to dairy . I’ll have to see what I can use for substitutions. Do you recommend putting them in the refrigerator or the freezer until you’re ready to warm them up? I’m like you….I’m a night owl and can’t abide trying to cook something for breakfast. I dislike most breakfast things, so it makes it even harder. Since I can’t consume dairy these days (severe inflammation happens), I used heavy cream from a local dairy that has only tested Jersey cows that don’t produce the A1 protein like the typical dairy cows the big farms use. It’s that A1 protein that makes me hurt all over. I also used almond milk for the regular milk. For the cheese, I used Daiya’s pepperjack (vegan) cheese. 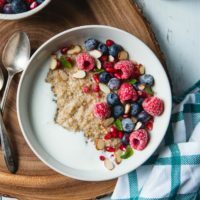 PS – would you mind if I posted a modified (dairy-free) version of your recipe on my website as long as I link back to this page? Since these are crustless, even my husband can eat them (he can’t eat gluten), so it’s a win for both of us! So…I made it with spinach only 2 cups, coconut oil about 1/4 cup and almond milk 1/2 cup. I also had to use dried basil and parsley, things go bad I my refrigerator too bad. I also used frozen pepper and onion blend sautéed in coconut oil. I also used parchment baking paper cut in to small sizes for the muffins. In addition. I did 2 size muffins and they came out amazing. I tried to insert a picture but couldn’t figure it out. Thanks for the recipe. Glad you liked them, Donja! Great idea, Carol — thanks for the tip! This is one of my fave recipes. I’ve made it several times now and will continue tondo so until the end of time. They’re super yummy and so incredibly convenient! I’ve tried various versions: exactly as the recipe is listed with added turkey sausag and shredded cheddar. Another time with all listed ingredients plus herbed chicken sausage, thyme instead of basil, and Gouda cheese. Tonight I did herbed chicken sausage, mostly sage with a tad of thyme, and Gruyere cheese. Every time they’ve been heavenly but, I think tonight’s might be the best (I think that’s thanks to the Gruyere). 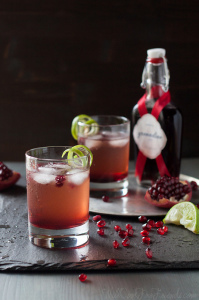 This is such an awesome recipe! Thanks so much, Willow! I’m so glad you like them, Lorene! Thank you for sharing. The gruyere and chicken sausage sounds like a wonderful combo! Thanks for this wonderful recipe! My parents just moved to a senior living center and their little apartment has a kitchenette. They get 2 meals/day in their deal – lunch & dinner (they love the food there.) They do not get breakfast but normally enjoy coffee cake or pastry, an occasional egg. Suddenly they miss morning eggs, since shopping and cooking are more challenging. I just made half this recipe today and they came out wonderful! I’ll be taking these elegant little muffins to them today, and if they like them I’ll make them whenever they wish, with whatever filling and cheeses they desire. They can store 6 of these in their fridge for the week and microwave 1 or 2 for breakfast as they wish. What a great idea! I’m so glad to hear everyone liked them, Nisha, thanks for sharing! And great idea using creme fraiche in place of the cream, I bet it tasted amazing! OMG, this recipe is out of this world! I made this for our mom’s breakfast group, and everyone loved it. The moms in our group are from all different countries, so it was especially pleasing to me that each of them enjoyed the egg muffins. They cooked beautifully and the house smelled soooooo good! I had no problem popping them out of my non-stick muffin tin. I do have two questions I hope you can help with. First, can this recipe be made using a deep dish pie pan to make a single large quiche? And secondly, how would this recipe work out if I used Egg Beaters in the carton as a substitute for the dozen eggs? Just curious. I would love to hear from you. This recipe is a winner. Oh, thank you so much for this comment, Linda! It makes me so happy to know everyone enjoyed them. Those are great questions. I haven’t tried either of those things myself with this recipe, so unfortunately I can’t say for certain how they would turn out. That said, I suspect they’d both work just fine. To make a single large quiche, I would probably take a similar approach to doing a frittata — that is, add the egg mixture to a non-stick skillet, or oiled cast iron skillet, and cook over medium heat, stirring occasionally and scraping the bottom of the pan until the eggs have started to form curds. Then transfer the whole pan to the oven and let it finish in there, until the center is set and the eggs have just barely cooked through (frittatas can be a wee bit tricky because you don’t want them underdone, but if you cook them too much the egg proteins contract and squeeze out their moisture, and there will be puddles of water at the bottom and rubbery eggs). For more detailed directions, I’d use just about any frittata recipe you can find as a guideline. As for egg beaters, I have absolutely zero experience in that department, but since they’re meant to replace eggs I’d say they *should* work the same. If you give it a try, I’d love to hear how they turn out! Made these muffins as part of a clean eating week. I did various fillings and always use a silicon muffin pan. For food on the go.it can’t be beaten. Cheap, quick and wholesome food. What’s not to like! Thanks for the sweet comment, Annie! I’m so glad you liked them! These are fantastic! I just made them and they popped out of the non-stick 12-cup muffin pan (heavily greased with non-hydrogenated shortening) directly out of the oven. Because I was in a hurry to deliver them, I left the 6-cup muffin pan on the counter to cool and came back about an hour later and they were just a little stuck, but not bad at all. I added 1/4 tsp dry mustard and used 1/2 tsp each of dried basil and parsley. I used more broccoli and omitted the spinach and jalapeno. They really taste great! My only disappointment was that they do deflate once cooled, but it does not detract from the taste! This is a keeper recipe! No matter how much I coated Bakers Secret muffin pan with butter the quiche stuck, BUT not with my brand new Sur La Table. The quiche was lifted out without scraping the sides. Huh — so weird that different brands work so differently! Thanks for sharing. I am a fellow not-a-morning-person, but I am desperately trying to be. I know that I feel better when I function at more normal hours, but waking up is hard. I tend to only leave myself about 10 mins to get ready in the morning-if that. 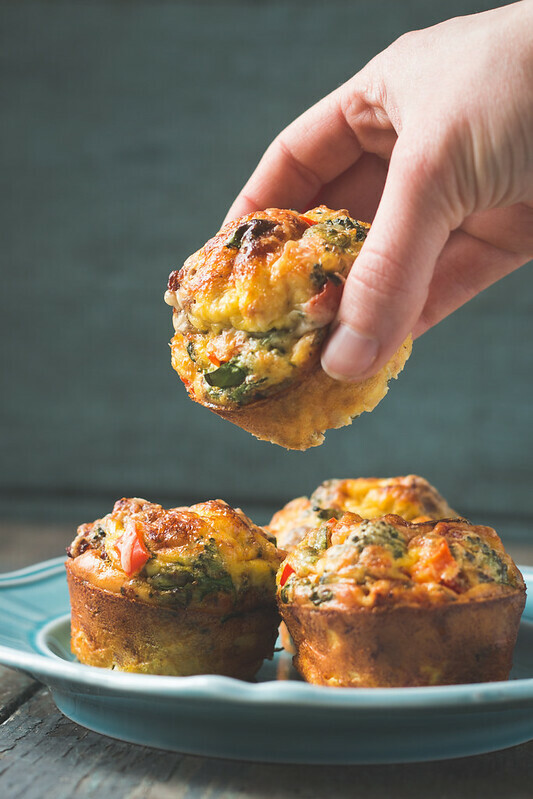 These mini-quiches look like the perfect way for me to squeeze breakfast in, which is great because as of now, I don’t get breakfast. 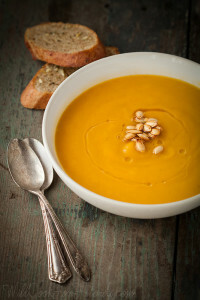 I need to control my eating more, and I’m hoping that this recipe will help with that. 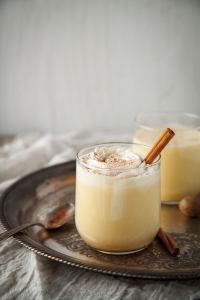 What would you say the general caloric content would be in this recipe? I want to incorporate it into a meal plan for myself, but I kind of need to know how many calories I would be consuming first. Thanks for a great recipe! Thanks for this comment, Andrea! I don’t include nutritional info on my recipes because it just isn’t possible to be 100% accurate (especially with something like this where a lot of the ingredients are variable, or “to taste”), and I wouldn’t want to lead you astray by guessing. That said, I know a lot of people who use sites like caloriecount.com, or apps like MyFitnessPal, to track their nutrition. Both of these are free to use, and can give you pretty accurate information about any recipe you make, even if you want to swap ingredients or make adjustments. If you’re keeping track of your calories I definitely recommend using a website or app like those. There are many out there, these are just ones I’ve heard good things about. I hope that helps! Do you know if I could make this with Almond milk? Just made these this morning. Turned out great! Thanks for the recipe. Will probably be my breakfast for the coming week after I freeze them! Thanks Michael, glad you liked them! And thank you for sharing photos, they look great! Recipe turned out great–used different cheeses for the toppings. Baked them in a silicon muffin pan and they almost popped out–didn’t need to struggle removing them! Tripled the recipe and sent them out as part of this year’s Purim mishloah manot food packages. Thanks from Israel. While these look and sound delicious I would not describe them as healthy with all that bacon, cheese and heavy cream. I would modify your description. Delicious, easy and inexpensive. But, Lord have mercy, the cleanup was awful. I read a lot of recipes and a lot of reviews, and I followed all the tips to keep them from sticking – nonstick pans, well-greased cups, knife around the edge, let them sit before removing, etc. etc. and they still made a mess of the pans. I made 96 for a wedding brunch, and the cleanup was a 2-hour ordeal of soaking, scrubbing, rinsing and repeating. Never again. LOL! For smaller quantities I would use silicone pans, but I can’t buy that many pans for a large event – I don’t cater professionally, so it would be too costly for just occasional use, but I may buy a silicone pan for my own use. That said, the recipe is great – flavor was good – needed a bit more salt for the veggie version, but the sausage version was right on. I’m so sorry you had such trouble with these sticking, Colleen! I’m glad they turned out well and everyone enjoyed them, but that cleanup sounds like a major pain. It really does seem to vary a lot from pan to pan — I have an old calphalon brand nonstick muffin tin, and have never had these stick in the slightest, but it seems to be really hit or miss depending on brand. Again, really sorry they stuck for you. I wish all nonstick pans truly were nonstick! These muffins have been fantastic. I do a workshop and make these for lunch and my attendees love them. I also have a couple for my breakfast in the morning. So thank you thank you thank you ?.I don’t have a problem with them sticking. I use a non stick muffin pan nod leave them to cool for a few minutes and they mostly come out no problem. I love them, they are so delicious. Happy days ?? Thanks Sally, I’m so glad you like them! Hi Holly, I’m so glad you liked them! I’m not a nutrition expert, so my advice is to use a website like caloriecount.com, or an app like MyFitnessPal (there are a bunch, these are just some that I know of) to plug in the exact ingredients you used to calculate all the nutritional info you’d like. I hope that helps! I have made this recipe several times and it is always a hit! Delicious! Has anyone ever made this recipe into a quiche in a pie pan or two? Or put the recipe in a 9×13 pan for a crowd? If so, how long should it be baked? What would you estimate for Cook Time if I am using a mini muffin pan for these? Hi Wendy, I’m so sorry I didn’t see your comment sooner! I haven’t tried these in a mini muffin pan myself, but I always recommend keeping an eye on any recipe you put in the oven, anyway. Ovens can vary a lot, and even the type of metal your muffin pan is made out of can make a difference in the cook time. I say pop ’em in for ten minutes or so, then keep an eye on them, checking every 3-5 minutes after that, until they are set all the way through. I hope that helps! These are absolutely amazing!! I made them for my one year old daughter and I, for a little on the go breakfast. I’m going back to work, after being on maternity leave and these will be a lifesaver when we need to leave at 6am. What a difference a pan made!!! I had two different brands of non-stick pans. The quiche from one pan came out relatively easily. I had a VERY difficult time getting them out of the other. In fact, I had an awful time cleaning that pan! Same batch, baked at the same time. Both were “supposed” to be non-stick. The only difference was the pan. I wish I knew which brand the easy one was. PS. Tasted awesome from both pans! Very disappointed with recipe. Did not look like pictures. More like a mini frittata or souffle than a “muffin”in that they puffed up in the oven but collapsed while cooling. Despite spraying the pan with a good quality cooking spray and allowing them to cool for 20 minutes still difficult to remove with bottom sticking to the pan. Clean-up also not easy despite being a nonstick pan. I cook and bake a lot so I don’t know what went wrong. Hi Debbie, I’m sorry to hear they didn’t turn out well for you! There have been a lot of mixed experiences with them in terms of sticking — it seems sometimes they stick terribly and other times remove cleanly, even varying from brand to brand of nonstick pan, which is unfortunate. I wish there were a simple solution to that one. As for appearance, that’s hard to troubleshoot. All I know is how they come out when I make them, but there are a lot of variables that can be a factor including differences in ingredients, oven temp, pan… I hope they tasted alright at least, and I appreciate the feedback! I was looking for no/low carb breakfast options for starting my keto diet that were just as easy as putting a frozen waffle in the toaster. Found these, and granted they take a little prep time at the start of the week, they taste great and have me looking forward to breakfast. I modified them a bit for 12 cups and only spinach and onion for the veggies. I just warm two up in the oven and eat them with some sliced avocado (sprinkled with lime juice and salt). Set for (almost) the whole week! Glad you’re liking them, Lindsey! I’ll have to try them with the avocado, yum!